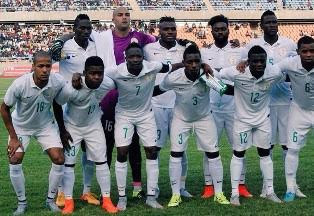 Welcome to Mercy Ebute's Blog: Lastest Fifa Ranking - Super Eagles ranked 63rd globally and 12th in Africa. Lastest Fifa Ranking - Super Eagles ranked 63rd globally and 12th in Africa. The Super Eagles have climbed up three places in the latest FIFA ratings for the month of January. According to FIFA's rankings released yesterday, the Super Eagles of Nigeria now occupy the 63rd position, while in the continental ranking they are in 12th place. Ivory Coast, Cape Verde Islands, Algeria, Ghana and Senegal are the top five teams in Africa respectively. Egypt, Chad and Tanzania - are placed 55th, 113th and 125th in the global ranking. The top five teams on the planet had no change, with Belgium leading the way followed by Argentina, Spain, Germany and Chile.